← It’s a Zoo at Kindermusik this Summer! Social-Emotional Learning: What is it and why does it matter? for the “pre-”. A preschooler is, quite simply, a pre-schooler until he or she is ready for school. And no matter how data-driven parents may become, most would still agree that beyond numbers, letters, colors, and such, there lies a harder-to-quantify but just-as-essential quality to school readiness. Because social-emotional learning can seem less quantifiable than, say, counting or identifying colors, some researchers have suggested breaking the concept into seven more specific areas. Confidence: A sense of control and mastery of one’s body, behavior and world; the child’s sense that he is more likely than not to succeed at what he undertakes, and that adults will be helpful. steps. Offer an appropriate amount of independence for the steps that will come easily; offer an appropriate amount of support during the steps that you expect might be more difficult. Muzzle Ms. Fix-It. For a child to develop confidence, he or she must be allowed to problem-solve independently and successfully. This doesn’t mean you can’t guide, assist, or support (see “Break it down”) – but if the task is developmentally appropriate, allowing children to “get stuck” can be a good thing. Only then can they experience the pride and confidence that comes when they persist and arrive at their own solutions. your own body in a variety of ways, use your voice freely, and express your emotions creatively, you’ll be demonstrating that you are safe and supportive and that expression is prized and welcome – two essentials for the development of confidence. Curiosity: The sense that finding out about things is positive and leads to pleasure. attention, prompting exploration, experimentation, and multi-sensory investigation of form and function. Mystery grab bag. Collect some mysterious items from around the house—things whose function might not be automatically clear, like a honeydripper, garlic press, eye pillow, binder clip, or monkey wrench. Put them in a bag or on a tray and investigate them with your child, one at a time. Make up creative functions for them. Do they make good instruments? your child see which it is. Challenge your child to guess which album the song comes from, based on the sound of the music and the look of the cover art. Intentionality: The wish and capacity to have an impact, and to act upon that with persistence. contributing a sound idea to a story or song) indicates a deliberate choice of one thing over others. Attending to a song or activity “all the way through” also shows intentionality, as a child must opt to disregard or delay other stimuli and impulses (a new skill, and still in development) in order to focus on the activity at hand. Sometimes intentionality seems like the last thing on an active toddler’s mind, as you follow his or her dotted path of 20-second fascinations, each rapidly investigated and discarded for the next. Other times, your child may “zoom in” on something so intensely that it’s hard to get his or her attention. Both are age-appropriate ways of interacting with the world and its stimuli, but as a child nears school age, he or she should become more able to engage with single activities for longer periods of time, persist through challenges, and demonstrate a longer view, longer attention span, and an ability to select, engage, and complete an activity. macaroni, hide-and-seek, Old MacDonald, or overalls). Puzzle me. Puzzles can be a perfect exercise in intentionality. Each piece presents a challenge, and each challenge presents a choice: persist or give up. Giving up often comes with other attractive activity options – but a child that knows the satisfaction of selecting, persisting, and completing an activity (like a puzzle) will likely push through the challenge to reap those emotional rewards. Hocus focus. You’ve almost surely heard some variation of the Kindermusik mantra: hearing is a sense, but listening is a skill, a deliberate act that requires intention and focus. Engaging in Focused Listening activities and exercises – both in and out of Kindermusik classes – is an intensive intentionality workout. Even for adults, it truly takes focus to shut out other, competing stimuli to focus solely on a sound or piece of music. Self-Control: The ability to modulate and control one’s own actions in age appropriate ways; a sense of inner control. While there is very little heavy-handed direction (sit there, play this, line up, etc.) in a Kindermusik class, there are plenty of experiences that provide learning opportunities in the areas of self-control—namely sharing, taking turns, respecting classmates’ personal space, stopping and starting movements, putting things away when you’ve finished with them, etc. almost miraculously effective, in contrast to verbal requests and/or explanations. Cue audio/visual. Use familiar signals to let your child know that a transition from one activity to another is coming. Establish a special song to signal the approach of naptime, for example, or flicker the lights when it’s time to clean up. Room for retreat. Providing a place where your child can go to “get away from it all” (to stave off or recover from a tantrum, for instance) gives him or her the opportunity to recognize his or her own patterns and signals and, accordingly, to develop self-knowledge and selfcontrol. (And no, it’s not too soon!) Music can be a powerful tool for relaxation and self-control, so consider equipping your child’s retreat space with a CD or tape player with easy buttons that he or she can control independently. Share and share alike. Give your child lots of opportunities to practice sharing – with you, with siblings, with stuffed animals, anyone. 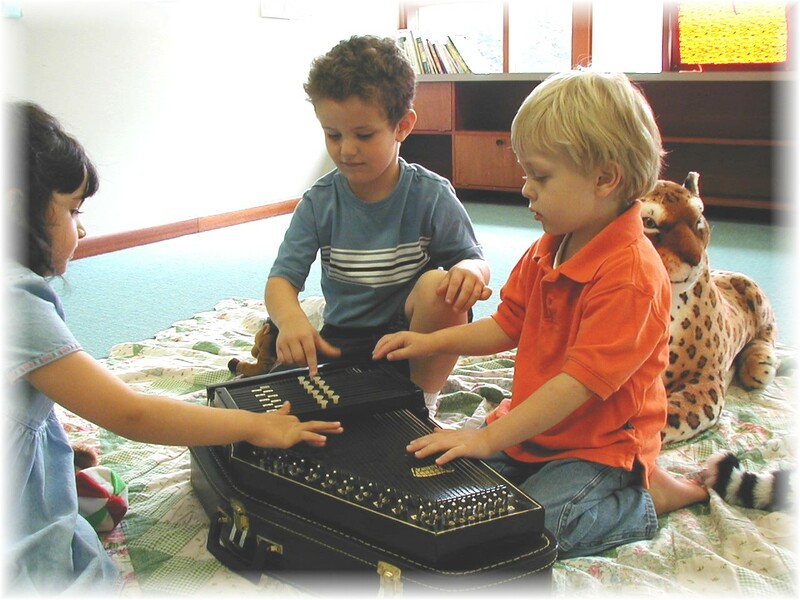 For fun, try this: choose one thing (an instrument, for example, or a toy) and allow your child to choose another. Set a timer for one minute, then switch toys. Repeat. Relatedness: The ability to engage with others based on the sense of understanding and being understood by them. appear to have a great impact on children’s sense of “the other” and of “the group”, not to mention an increasing awareness of the emotions of others and an enhanced ability to cooperate. 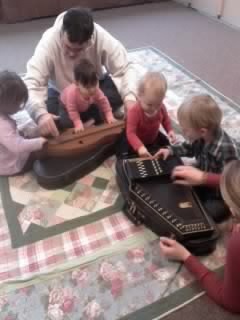 Watch a group of young children holding hands in a circle or passing an instrument around the group, for example, and relatedness comes to center stage. According to research, young children who demonstrate relatedness in preschool settings tend to be children who have trusting relationships and secure attachments with familiar adults—so the things you’re already doing with your child at home (offering patience and comfort, teaching about feelings, empathy, and respect, etc.) are exactly what you should be doing to continue to foster this important skill. dancing, partnering, swaying, clapping together, playing instruments together, singing together—almost any “together” musical experience is bound to be a relatedness slam-dunk. you can provide a relaxing, positive, and social music-making experience by providing each child with his or her own instrument and encouraging the group to enjoy playing music together without the emotional challenge of having to share or take turns. Be a joiner! Connecting with your child one-on-one in a compassionate way that emphasizes kindness and respect is essential, but engaging in activities with larger groups and other adults and children is just as important. Try to add experiences to your child’s day that integrate big groups, small groups, people of ages and cultures other than your child’s, as well as new sounds, sights, animals, spectacles, etc. The “bigger” your child’s sphere of experience, the more universal his or her sense of relatedness will be able to become! Capacity to Communicate: The wish and ability to verbally exchange ideas, feelings, and concepts with others. when we also begin to engage in it for its own sake—in other words, to communicate for pleasure, for connection, for fun. In a Kindermusik class, children are made, foremost, to feel secure, then encouraged to explore a variety of media for self expression. They learn—through songs, dances, instrument exploration, instrument play, and movement activities—that voices, bodies, and instruments are all tools they can use to communicate, and that there are subtleties in sound and movement that they can use to change the message they are trying to convey. very best and most important thing you can do, and the recipe for this environment is simple. Offer your child a feeling of emotional security. Place a high value on expression. Model communication, expressiveness, and open lack of judgment yourself. Then give your child full access to the “tools” of expression—not only instruments, art supplies, books, and music, but also conversation, adventures, and access to a you that has the time and freedom to move, dance, tell stories, and be outlandish! Teach emotion words. As you’re teaching your child the words for colors, numbers, animals, trucks, dinosaurs, parts of the body, and what have you, be sure to include the words for a large number of varied emotions as well. Young children experience the same large range of emotions that adults do, but don’t often have access to vocabulary to describe and identify those feelings. Paint that tune. Choose a couple songs from your CD collection or cue up a short MP3 playlist. Get out some crayons or paints and alongside your toddler, as you listen to the music, make some expressive art that represents how the music makes you feel. Use as many pieces of paper as you like, but at least one new one for each song. Get in touch with your inner orchestra. Cue up a couple sound samples of a variety of instruments. (Search “instrument sound clips” on the Internet.) Engage your child, as he or she is able, in a discussion about which ones he or she likes best, which samples feel happy, sad, afraid, angry, sleepy, excited, etc. Then get up and move your bodies in a way that “matches” the instrument’s sound. Cooperativeness: The ability to balance one’s own needs with those of others in a group activity. “Children who are cooperative may imitate others and then join in, participate in small-group activities, begin to follow simple classroom rules, help put away toys or wipe a table, and offer help to another child.” Read the above, then witness a Kindermusik class, and you’ll agree that the Kindermusik classroom is fairly bursting with cooperative activity. Cooperativeness makes for an interesting intersection of the other six social-emotional competence categories discussed. A cooperative child, for instance, can demonstrate self-control (take turns, for example), express relatedness (play a group game), and communicate (contribute ideas to an activity) in order to allow for an experience that is enjoyable for the entire class, and not just him or her. Though surely not every Kindermusik activity and lesson are orchestrated with 100% cooperation, research does reveal clearly that experiences with music make children better able to work and play successfully and in cooperation with others. Practice makes per-cussion. Give each child one shaker, drum, maraca, or other instrument. Begin playing a simple, steady, 3-beat rhythm (as in, shake-shake-shake (pause) shake-shake-shake (pause)). Ask the children to follow your lead, shaking or tapping their instruments in the same rhythm. Try a handful of other simple rhythms (for example, shake, (pause), shake, (pause)), always asking the children to follow your lead to try to play together. Conditioned response. Using musical cues for certain behaviors— cleaning up, preparing for bed, etc.—has been revealed to be a startlingly effective way to generate cooperativeness among young children. While verbal requests for the same behaviors sometimes invite dawdling, negotiation, or refusal, musical cues generally do not. Try rolling a naptime riff, clean-up tune, or bedtime ditty into your routine. The joy of ensemble. Nothing says cooperativeness like a musical marching band! Allow children to make or select their own instruments, then set up a route, and create a rotating order so each child gets a turn to be the leader. Then strike up the band and get moving! Pressed to define the look and feel of social-emotional development, you might find it difficult to quantify or even to describe – but you know it when you see it, and you certainly see it in a Kindermusik class. A child offering a toy to a peer who is crying; holding hands with a partner; moving, singing, or speaking expressively; or asking an adult for help. Children taking turns playing a drum; moving with scarves in whatever way makes them feel most like wind; dancing with parents, teachers, and classmates; hugging their teacher at the end of class. The amazing fact is that to researchers’ awe, music and movement experiences seem to tap positively into every domain for social and emotional development in toddlers. On the whole, young children who spend time singing, playing, and moving with other children find themselves better prepared to be confident and self-aware, build positive relationships with peers, and get the best out of the learning environments and opportunities that life will bring them.